HICKORY, NC. U.S.A., April 27, 2015: Nordson Corporation has developed a new sealing technology for its slide-plate screen changers, enabling them to provide reliable leak-proof melt filtration at higher temperatures and pressures and substantially lower viscosities, the company announced today. The seals on Nordson Xaloy slide plate screen changers prevent leakage by utilizing an innovative design that seals effectively at both low and high pressures, temperatures and viscosities. The new Nordson seal enables the slide plate screen changers to perform reliably at temperatures up to 650 °F (345 °C), pressures up to 7,500 psi (515 BAR ), and viscosities as low as 15 pascal seconds. (15,000 centipoise). This represents a significant improvement in performance with low-viscosity materials in comparison with earlier sealing systems (see graph) for slide plate filtration. 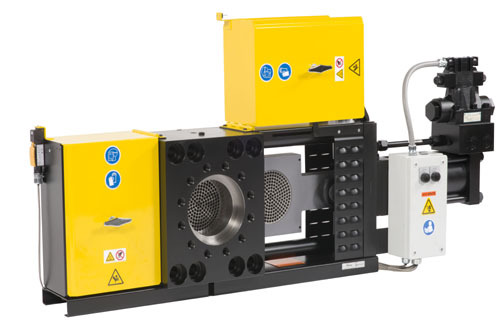 The new high-temperature sealing system is available on both manual and hydraulic slide plate screen changers, noted Parke Strong, R&D engineer, and it can be retrofitted on existing equipment.